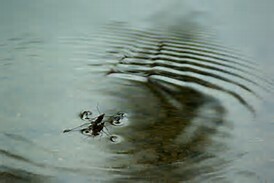 Waterboatmen/ water striders : small insects such as waterboatmen can ‘walk on water’ because their weight is not enough to penetrate the water. Held up by the magic of surface tension. I must hurry, I’m late for whatever keeps me busy. into the dark depths of the water. Into a realisation of my own mortality. Enough to know that it’s there. at a search engine like Google is a convenient way to get an overview of his distinctive body of work. Thank you for telling me about Charley Harper & his work – all new to me. I shall Google him. Like the sound of his way of depicting wildlife. I like images – even try drawing some. Not wildlife as yet, mostly people and my dog. Hey there Francine! I found your blog today, and I’m nominating you for That’s So Jacob’s March Blog Madness! It’s simple: find five interesting blogs today, copy and paste this comment to theirs, and give them a follow! Have a great day and if you’re so inclined, kindly come visit me over at http://www.thatssojacob.wordpress.com. Have fun spreading the blog love this month!